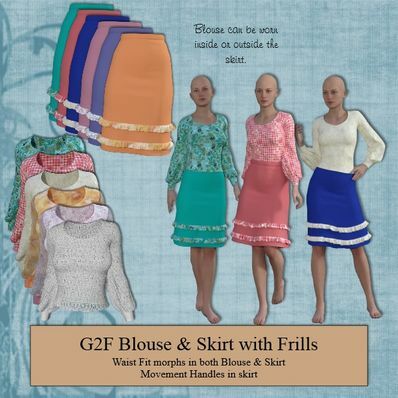 Blouse & Skirt with Frills for Genesis 2 Female for use in Daz Studio 4.8. Movement Handles included. Waist Fit morphs in both Blouse & Skirt. I have also included several Textures. It is not recommended to render skirt without the frills as they leave marks on the skirt. Just perfect &#305;'ve just discovered your works ! Wonderful creation. Love it! Thank you so much! Thanks Wendy. Very sweet skirt & blouse. Happy 2017 to you. Thank you so much for sharing, and for continuing to support G2F!! Oh this is so lovely, have not seen anything like this at DAZ or Renderosity! Thank you so much and always, always appreciate all the beautiful textures or variations!! Thank you for your many share, all of them are nice.